Sounds like you had success with this one, Grace! Don't you love naan? So many things you can do with it. I am not a hot and spicy sauce fan- one of the few, I know- but your super photos made my mouth water. Ahhh, dude, let me know before you go back! I am totally jonesing for that lunch buffet now! And I'm glad you finally got a hit on the chicken wrap tour of the Cap Region! The spiciness sounds good, but you're right about gristle! I really need to time my visits to your blog a little bette again its lunch time and I'm starving. 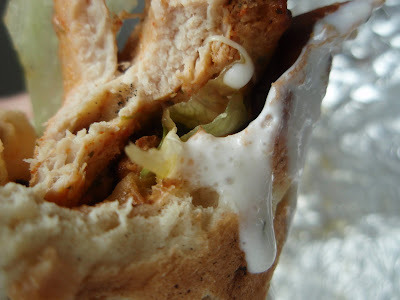 Now only a chicken wrap will do; one that looks EXACTLY like your droolicious photos. I agree we no like fatty chicken in anything! We have a local Lebanese restaurant which is fantastic! Not into gristle, but that wrap sounds great! Sounds and looks fantastic! Girl, you're making me want to come visit Albany! i am loving your quest. though my guess is that the best one is the one you make yourself. It all sounds great, except for the fatty chicken! 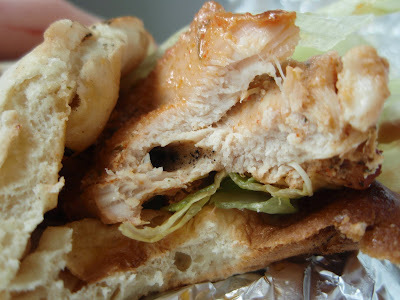 Sounds like the wrap was great overall - the fatty chicken is unfortunate but the spiciness and the naan make up for it! Not a fan of fatty chicken but I think I would be a huge fan of this wrap. The last shot with dripping sauce made me drool. yeah, I'm going to need more sauce with this. thank you! Mmmm, sounds good (with the exception of the fatty chicken, of course). Love the skewer hole photo! I looooove spicy stuff, so I'd be all over it! Too bad about the gristle. Not down with that either. Ruins my appetite! Nothing worse than biting into that when having an otherwise enjoyable meal. Mmmm! I shouldn't be reading this while hungry. "Soft, pillowy, and slightly chewy naan" just sounds sooo great at the moment. Definitely my kind of food. I really enjoy Lebanese food. This chicken wrap looks really good. The bit about the lip burns...Oh, I could so enjoy this spicy flavor. You have to go back and check out the buffet and share your experience with us. I am so glad you found what you were looking for. That buffet sounds amazing. I can never resist Lebanese food. Last week, in Ottawa, I went to Lebanese restaurants 3 times. We don't have them in this town. Wow those photos were amazing. Almost pornographic!!! 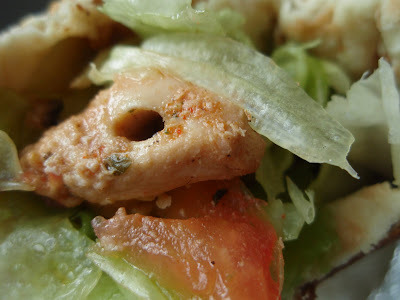 That recipe is an awesome addition to any of the chicken recipes I usually make for my lovely husband. If he behaves himself he'll get this one soon.